Liability policy covers the legal liability imposed on a business that sells, dis- tributes or serves alcoholic beverages. A good deal of alcohol-related liability claims fi led against bars, taverns, and restaurants are a result of liquor-in- duced fi ghts or altercations, or water- craft accidents, in this case. Charlie’s tenant’s coverage. The fl edg- ling Jet Ski rental company had CGL policy but unbeknownst to Charlie, its policy included an Aircraft, Auto and Watercraft exclusion, leaving them with no insurance coverage to cover the patron’s claim. And wait, let’s not forget Charlie’s fueling station subcontractor who was equipped with a Marine General Liabil- ity (MGL) policy to cover his operations by the water. What he also had was an absolute pollution exclusion – therefore, he did not have fi nancial protection to cover the cost of the fuel spill cleanup. Charlie learned a lot of lessons that day, and the marina’s insurance cover- age took a hit again as he was held liable for his tenant’s gaps in insurance cov- erage. Now Charlie is walking on egg shells until his next insurance renewal, as he knows that his continuing marina business is dependent on fi nding prop- er and affordable insurance coverage. 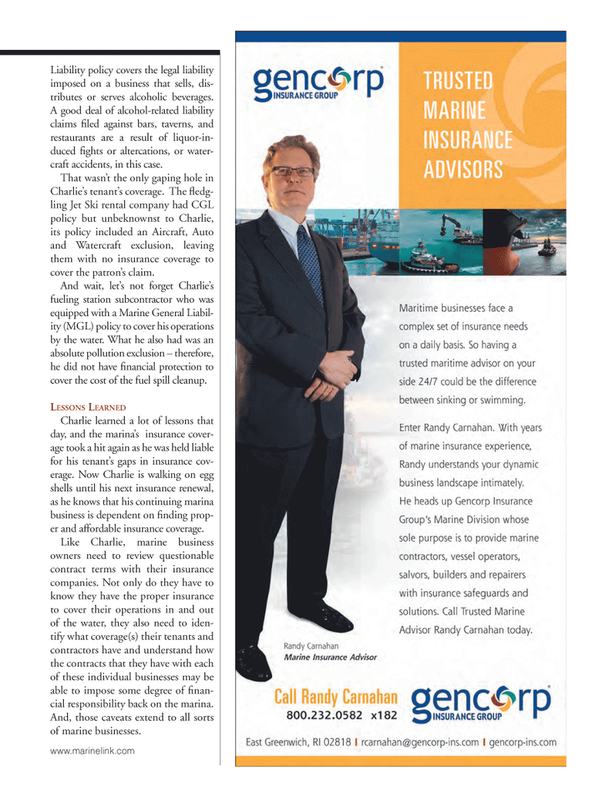 Like Charlie, marine business owners need to review questionable contract terms with their insurance companies. Not only do they have to know they have the proper insurance to cover their operations in and out of the water, they also need to iden- tify what coverage(s) their tenants and contractors have and understand how the contracts that they have with each of these individual businesses may be able to impose some degree of fi nan- cial responsibility back on the marina.